During the 67th Regiment's last weeks on the Senio River line in Italy, it welcomed a new Battery - 315 - from the 105th Anti-Tank Regiment, R.A. The Battery's origins were as part of a medium regiment of artillery formed at Tarporley in Cheshire, which on arrival in Egypt in September 1941 was converted to the anti-tank role. As B Battery of the 73rd (later 95th) Anti-Tank Regiment it fought throughout the desert campaigns. When the 95th was broken up it joined the 105th Anti-Tank Regiment and became known as 315 Battery. The following account of its time with the 67th is taken from a short battery history published in Italy at the end of the war. We were ordered to join the 67th (East Surrey) Anti-Tank Regiment, R.A., the Divisional Anti-Tank Regiment of the 56 (London) Infantry Division. Our new Regiment was in action on the Senio River line and so we moved over to them taking over the positions and equipment of 150 Battery of the 93rd (Argyll and Sutherland) Anti-Tank Regiment, R.A, For the next ten days we were principally engaged on harassing fire tasks in an indirect role. On the 10th March 1945, the 56th Division was withdrawn. The Regiment, under command of Lieut Colonel F. E. Shrimpton, M.C., R.A., moved to occupy billets in Cervia, a small coastal town near Cesena. The next three weeks were spent training and reorganising the Regiment on the new establishment of three mixed Batterys, with two troops of 6 pounder guns and one troop of M10s, and one complete Battery of S.P. [self-propelled] equipments. This Battery was, of course, ourselves and we retained the title of 315 Battery. The Battery left Cervia on the night of 29th of March and moved under conditions of great secrecy to the Divisional Artillery concentration area, some ten miles north of Ravenna. On the first of April, an attack was launched by Commandos under Divisional command - on a spit of land running between Lake Comacchio and the Adriatic Sea. "J" Troop was giving direct support to this attack while the remainder of the Battery was deployed in an indirect role to thicken up concentrations and harassing tasks fired by the Divisional Artillery. This attack, designed to confuse the enemy concerning the real intentions of the 15th Army Group, was entirely successful. Many prisoners were taken and the spit, south of Porto Garibaldi was cleared. Two days later the full scale offensive, designed to destroy all the German forces in Italy, was launched. The Battery, less "J" Troop, which had been left on the spit to support the Italian Garibaldi Brigade advanced up the west shore of Lake Comacchio with the rest of the Division. We were employed in both indirect and direct roles almost continuously in support of all three Brigades and much good work was done. "K" Troop had the most spectacular success of the advance during the Argenta Gap battle, being credited with three Mark IV Special tanks without loss to themselves. "J" Troop had now rejoined us for what we feared would be a very sticky battle - the crossing of the River Po. It turned out that the enemy had taken a much more severe thrashing than we had realised and we crossed the vast river barrier without incident racing at breakneck speed to the next River, the Adige, with hardly any sight of the enemy. By this time, the hunt was well and truly up - we crossed the Adige, without any difficulty and "J" Troop with the Battery Commander in his recce vehicle and a Squadron of the 48 R.T.R. indulged in a mad chase up to Venice. A few days later the battle in Italy was over. The German High Command in the Italian theatre had surrendered unconditionally - a prelude to the final victory of the allies in Europe. The unending succession of new designations for the Battery had not, however, ceased. 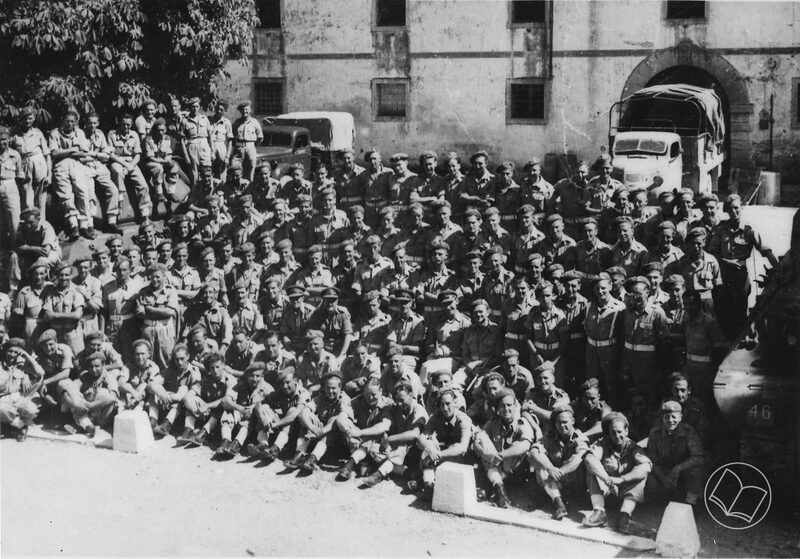 On the 3rd June 1945 a ruling was received to the effect that were to take over the number of the Battery which had been disbanded at Cervia - and we became 171 Anti-Tank Battery.